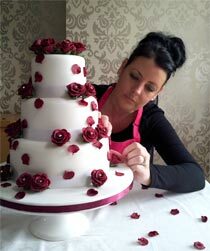 Exquisite bespoke cakes for every occasion! My name is Tammy Rogers, from an early age I have always had a talent for Art and Design, my flair has been passed down from my Great-Grandad, Grandad and Mum! With this passion I went on and achieved GNVQ in Art and Design, followed by a BTEC National Diploma in Graphic Design! I first realised this in March 2010, when I made my son’s 3rd birthday cake for his pirate party. It inspired me to carry it on, when I had great comments off all my family and friends. I would often, as a gift, make cakes for them all, I am now living my life long dream of setting up my very own ‘giving people the best gift you can’, and turning them into pieces of art! There is nothing more rewarding than handing over their very own Boutique Cake and seeing their response, it’s truly breath taking! I really am looking forward to the future and full filling my dream! All of our creations are freshly baked at our kitchen for each and every order, we have varieties of delicious flavours and dreamy fillings, we use our very own special recipes, using the finest ingredients. All of our sculptures, flowers and characters are hand crafted sugar decorations and all made by ourselves. We take a lot of pride and attention to detail, to ensure a high standard of customer service and also to ensure that our cakes, not only taste moist and delicious, but have the ‘Wow’ factor for your special occasion. We hope that all your guests will enjoy our ultimate creation and be ‘wowwed’ by your very own Boutique Design! A sketch is now drawn up to show you what your very own Boutique Cake would look like to your requirements. Finally your very own unique bespoke boutique cake for your special occasion. Copyright © 2012 House of Boutique Cakes, All rights reserved. Terms & Conditions / Privacy / Website by The Elm Design Co.